While variants of “urban” trains are often used in suburban service, there have also been a number of specialized models developed for such use. 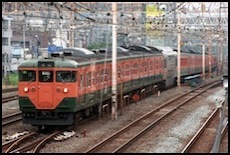 Although dating from 1963 (sets were built through 1983), the 113 and its cold-weather variant the 115 series continue to be used on several lines in and around Tōkyō today, including the Chūō Line and Musashino (Rapid) service. The model is a steel train, capable of 110 kph. The 211 series was developed (in 1985) to replace them, but sets remain in service 25 years later on more remote lines. The 211 series was introduced in 1985, as a replacement for the aging 113 and 115 series equipment. It had a stainless steel body, and regenerative brakes, and was capable of 110 kph. It remains in widespread use. 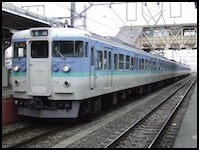 The 415 series was introduced in 1971, however only the 415-1500, introduced in 1986, remains in use near Tōkyō. It is capable of 100 kph. 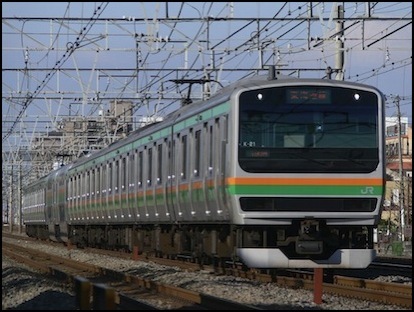 The train operates on both 1,500 Volt DC and 20,000 Volt AC (at either 50 or 60 Hz, so it can be used in both Western and Eastern/Northern Japan). These are being replaced by the E531. The 415-0 series was used on the Jōban line until 2007. 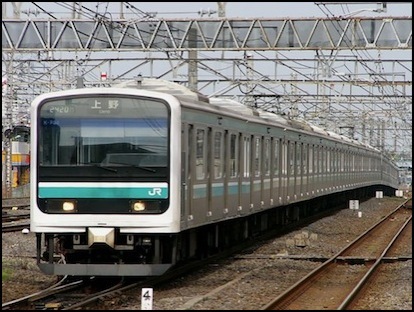 The 415-1500 series was (and apparently still is) used on the Mito line, but runs through on the Jōban line to Ueno station, and operates in 4 and 7+4+4 car sets. The E217 series is a DC EMU, and was introduced in 1994, again as a replacement for the earlier 113 series. It was based on the 209 series, and incorporated many of the technical advances of the later E231 series. These included a strengthened cab and other features to protect the driver in grade crossing accidents. It has a top speed of 120 kph and is bears a “blue and cream” stripe, supposedly representative of the seaside area it serves along the west side of Tōkyō Bay. 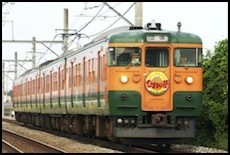 The trains are apparently also used on the Chūō Main line. Around 2007 the cars were updated, gaining redundant electronic systems, and the color of the stripe was lightened at the same time (Kato issued a model based on these changes in January of 2011). The train operates in 11+4 sets (4M7T+2M2T, for a total of 6 motor cars). It was originally equipped with VVVF inverters, GTO thyristors and AC motors rather than the VVVF/IGBT system of the E231. In the 2007 update, these became the now-standard VVVF/IGBT. 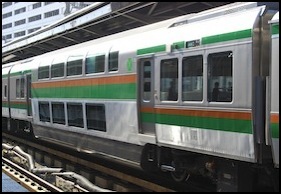 In 2006 some trains were reassigned for use on the Tōkaidō Main Line, and painted in the green and orange Shōnan colors, but these do not operate to the Shōnan-Shinjuku line, as they lack the necessary cold-weather fittings and semi-automatic door equipment. While the first trains in these series were urban commuter trains, they have also been used in outer-suburban applications. These variants are distinguished by traverse (booth) seating, often in addition to longitudinal (along-the-wall) seats in other parts of the cars, toilet facilities, and the use of a couple of double-decker “green” (first class) cars in some trains. The E231-1000 is used on a number of lines (wikipedia lists seven), and the E233-3000 is used on the Tōkaidō Main Line. Both models have a top speed of 120kph. Both are at least sometimes used in 5-car and 10-car sets, departing from Tōkyō coupled in 15-car trains, which may later split. Both have two motorized cars per 5-car set, but the E233 has 6 motor cars per 10-car set, while the E231 has only four. 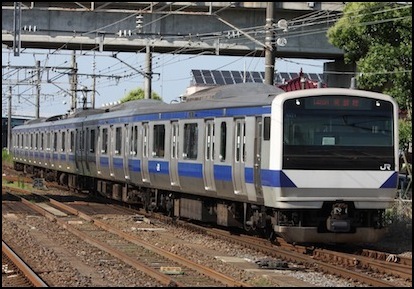 The E501 series is an AC/DC EMU variant of the 209, introduced in 1995 for use on the Jōban and Mito lines. It has a top speed of 120 kph and is equipped with regenerative brakes. The train operates on both 1,500 Volt DC and 20,000 Volt AC (at 50 Hz, so it can only be used in Eastern/Northern Japan). The Jōban line beyond Toride (43 km from Tōkyō Station) uses AC power. 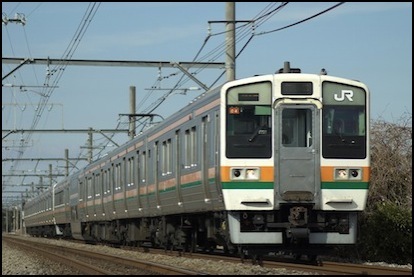 Although these trains originally operated on the Jōban line out of Ueno in 10+5 car sets, in 2007, following the introduction of the E531, they were modified (had toilets installed) and were reassigned to local service beyond Tsuchiura (70km from Tōkyō) in the Mito area. 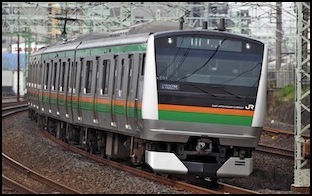 The E531 series is a variant of the E231, introduced in 2005 as a replacement for the 403 and 415 series trains (and apparently also the E501 series) used on the Jōban and Mito lines. It has a top speed of 130 kph and is equipped with regenerative brakes. The train operates on both 1,500 Volt DC and 20,000 Volt AC (at 50 Hz, so it can only be used in Eastern/Northern Japan). The cars are equipped with IR/UV absorbent windows, easing the effects of sunlight on passengers, and reducing the load (and power use) of the air-conditioning. It is operated in 10, 5 and 10+5 car sets (the latter into Ueno station in Tōkyō). The 10-car sets now include a pair of double-deck cars. Introduction of New Rolling Stock (PDF), JR Bulletin 57, March 2007, article on the E721 DMU which briefly mentions the E531.